ARTsouthAFRICA in Conversation with Esther Mahlangu, the prolific South African Ndebele painter about being rooted in tradition, the Esther Mahlangu Ndebele Art School, her recent large-scale mural commissions for the Virginia Museum of Fine Art (VMFA) at the end of last year and a solo exhibition celebrating her 80th birthday. This interview appears in full in the ‘Painting’s Not Dead!’ Issue (13.4) of ARTsouthAFRICA – on shelves at a store near you soon! You will also be able to read this exclusive content in the July Digital Issue. ABOVE: Esther Mahlangu. Photograph copyright Fred de Jager and courtesy of 34FineArt. 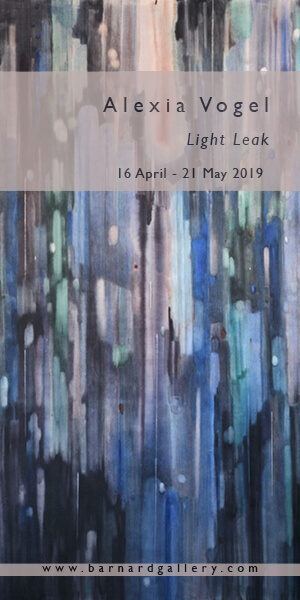 ARTsouthAFRICA: Hello Esther – it is such a privilege to be able to discuss with you your long and illustrious career – thank you for contributing to this issue! Your career was catapulted into the international art world when you were invited to participate in the landmark exhibition, ‘Magiciens de la Terre’ in Paris in 1989. How did it feel to garner international attention for your work, which you had been creating for most of your life already? It was very strange to suddenly get so much attention and everybody knew my name, even from over the sea. Back home I was just painting because I loved doing it and it was always admired and seen by my own people. When I was invited to go to Paris, this changed. It was the first time I ever travelled on a plane and I did not know what to expect. When I was painting my house in the Centre Pompidou and saw how happy it made people that came to see the exhibition, it made me happy as well. I felt that the people from France understood my work and they showed me great respect. Since then I have always been treated much better internationally; it seems that more people visit museums and appreciate art than in my own country. Every time I travel or I am invited to paint I know it is because of that very special exhibition that opened up my world and gave me the opportunity to explore new countries and meet artists who work in different styles. Today my work is in many museum collections all over the world and that makes me happy, as I know long after I am not here any more, people will still go and see the paintings and they will remember there was an artist called Esther Mahlangu. Despite critically evolving the art of traditional Ndebele mural painting for projects created in a global, contemporary art context, you continue to use many traditional techniques and equipment – like your special, handmade chicken feather brushes. Please could you speak a little bit about your opinion on this marriage between traditional and modern practices? As Ndebele people, we grew up with this kind of art. It’s in our blood – it is why I continue painting in this way. Young Ndebele people may not know where life will take them, but the art roots them in their Ndebele culture. It’s in my heart and it’s in my blood. The techniques that I use are what I know; it was taught to me by my mother and my grandmother, the images have changed and the colours have changed and I have painted on many different surfaces and objects but it still comes from my heart as I love to paint. Most of the tools I use are also still the same – the small brushes are made from chicken feathers, the big tool I use for drawing thick lines is made from ‘Bobbejaan’s stert’ (‘baboon’s tail’), a plant that grows here in Mpumalanga. Sometimes when I can’t get chicken feathers overseas I use commercial brushes but I don’t like them. I also realise that the old must change otherwise it dies and nobody wants to just look at the old; the new people I meet overseas want to see new works and new designs and that’s why I always try to something new with my work. I sometimes incorporate figurative images to tell a story in my painting, which not many of the other Ndebele have done in the past. I also see new things on my travels all the time so I need to paint them to capture them on my canvas for the people who didn’t see it. I am never scared to incorporate new ideas in my work, as I know change is good. My art has evolved from a tribal tradition of decorating the home to where I am now. Yet you choose to use commercial paint instead of traditional pigment. Is this a decision based on convenience or aesthetics? When I was a little girl and started to paint on the houses with my mother, we always used the natural pigments and cow dung – but when we were introduced to the [commercial] paint, it was so colourful and bright and I decided that I wanted to use that instead. It is not possible to take cow dung with me when I travel to show my painting or to teach people how to paint, therefore I have to improvise by mixing colours to represent the traditional natural pigment colours. I still include the old traditional painting style in some of my works just to acknowledge the people that were there before me. As more and more colours become available I like to use them in my work as it makes it different from other traditional Ndebele works. Since 1979, BMW has commissioned 15 artists – including the likes of Alexander Calder, Andy Warhol, David Hockney, and Keith Haring – to transform the bodywork of a car into artwork in the BMW Art Car Project. Not only are you the first female artist who has been invited to paint a BMW car (in 1991), you are also the only non-Western artist. How do you think this reflected on your career as a contemporary artist at the time? I was not aware of the significance of what I was asked to do – it was just another challenge that I accepted. It was the first time I had painted on a big object like that instead of a house; I could see the design in my head and I just wanted to get started! I painted on a door first to get the feel of the surface and then started with the painting. I didn’t know the importance of the other artists who did cars before me but I was very proud of my car and knew it would be seen by many people who would not have the opportunity to come to my house in Mpumalanga to see my house or my paintings. What did attaining such an achievement mean for you, both professionally and personally? Before my visit and the painting in the Pompidou in Paris, I never knew that there were so many people and so many artists that make paintings and artwork. The BMW commission was one of the highlights of my career as many people then invited me to do work for them and Museums all over the world invited me to come and paint for them. Everybody wanted me and it made me feel very proud of who I am. At your home in Mpumalanga, you make a living by marketing an ‘authentic ethnic Ndebele experience,’ selling beadwork and traditional paintings that some might refer to as craft to tourists who visit the area. You are also, however, a highly regarded contemporary artist in the international art world. How do you navigate the tension between ‘cultural tourism’ and marketing ‘highbrow art’ to the international art market? 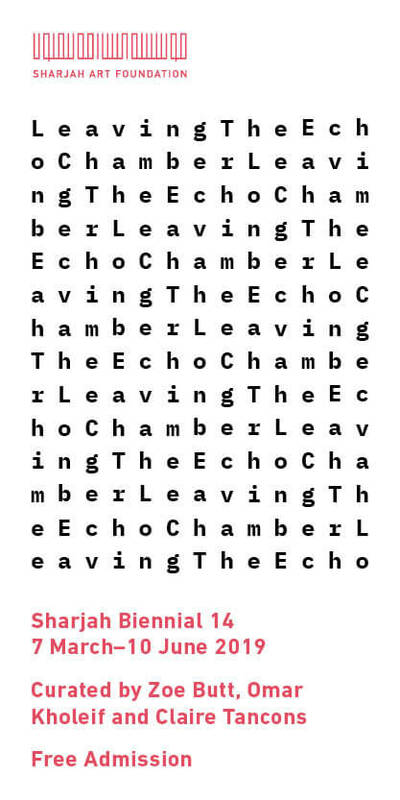 This is a difficult one as Esther is just Esther. Even if I am overseas at a museum exhibition or eating in a big hotel, I always stay the same – I don’t eat strange food and prefer to cook for myself when I go overseas, I never wear western clothing and I keep to my tradition. The shop that I have at my house is to give visitors the opportunity to take a small piece of Ndebele with them when they go home. Remember, I also have the school and train young girls to do beadwork and painting and I sell some of these works in the shop as well. When I am at home I keep myself busy with small things in between preparing for exhibitions, and when the tickets and invitations arrive to go overseas I pack, take my best blanket and go wherever they need me as I know this is another opportunity to show the world my art. For your commissioned mural paintings at the Virginia Museum of Fine Art (VMFA) in September 2014, the public was invited to observe you while you painted. In this way, you become somewhat of a performance artist through your practice – how do you feel about this? Do you think that this performative aspect enhances your work? Even though you are approaching your 80th birthday, you remain active as an artist at your home and studio in South Africa and you also teach traditional painting to young girls in the community. Why is it important to you to remain hands on at the school, and what do you hope to achieve through the Esther Mahlangu Ndebele Art School? 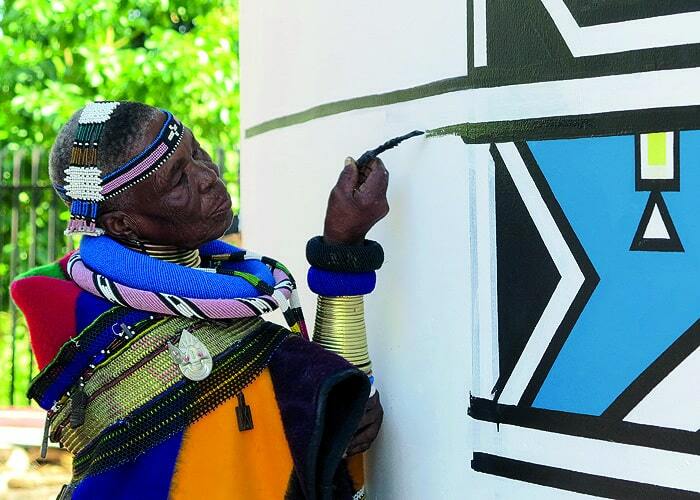 As Ndebele people, we grew up with mural painting as it forms part of our culture. It’s in our blood. But because of the changes in South Africa and the fast disappearing culture, the young Ndebele people may not know where life will take them, as most of them leave the rural areas and go and work in big cities like Johannesburg and Pretoria and, although I believe the art roots them in their Ndebele culture, it is important to plant the seed and to let it grow before they leave. There are not many original artists left in my community and that is very sad as nobody will be left to pass on the painting tradition. My hope is that some of the girls will one day return and follow in my footsteps but I can only hope for that. Finally, please would you tell us about your upcoming solo exhibition and projects? What can we look forward to seeing? This year is a very busy year and I will go to Santa Fe, New Mexico, twice because they called me to come, not just to paint but also to celebrate my birthday as I have many friends there. I am very excited about the exhibition that is planned to open on my birthday (11 November 2015) at the Irma Stern UCT Museum where I also had my first exhibition in Cape Town. I have been working on it since last year and will go to visit Cape Town again. I am working with British artist STIK, who asked me to do two paintings with him. It reminds me of working with artist Sol LeWitt, in 2000 in Lyon, France where we painted together. A Swedish company is also using my designs on sneakers for Paris Fashion Week, so lots of people will walk with Esther for her birthday this year!